Levitt Foundation Executive Director Sharon Yazowski presenting at the 2017 Grantmakers in the Arts Conference. 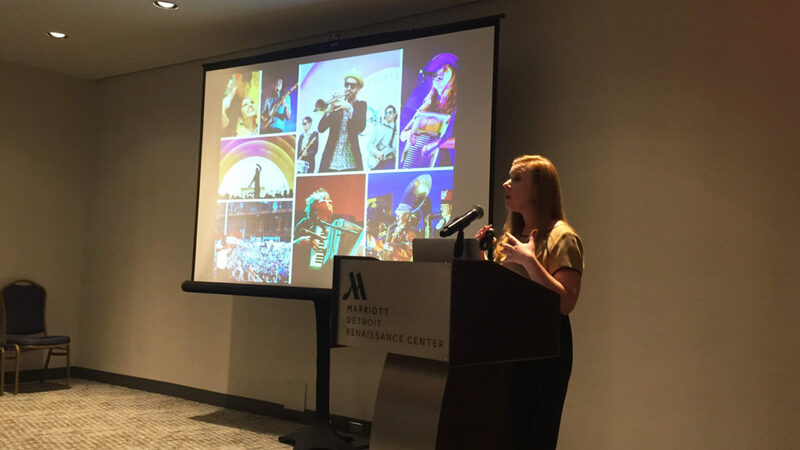 Yesterday, Levitt Foundation Executive Director Sharon Yazowski was out in the field with Slover Linett Audience Research President Sarah Lee, presenting an interactive session at the 2017 Grantmakers Makers in the Arts Conference in Detroit. Together they demystified the process of impact assessment, sharing experiences from Levitt’s own journey into the creation of a multi-year impact study with Slover Linett and giving professionals in the grantmaking community the tools and knowledge they need to embark on their own assessment journeys. Inspired by yesterday afternoon’s presentation, today we’re releasing the fourth installment of our “Research Recap” blog series, featuring posts that highlight a particular finding from our recently published impact study. With tomorrow being Halloween—an evening where costume-clad celebrators take over sidewalks (some of the most common public spaces out there)—we’re focusing on the value of spaces where people of all ages can move around freely. With car culture prevalent in many cities across the country—including right here in Los Angeles—exploring open public spaces by foot can feel extremely rewarding and refreshing. Whether it’s a park, plaza or sidewalk, there’s a sense of empowerment that comes from moving freely around a public place by foot. Looking around any given Levitt concert, you’ll find this to be true for concertgoers of all ages—from a group of teenagers dancing and singing with the band up by the stage, to a couple exploring the venue’s community booths and food vendors, to parents beaming as they watch their young children transforming a small patch of lawn into their own personal dance floor. 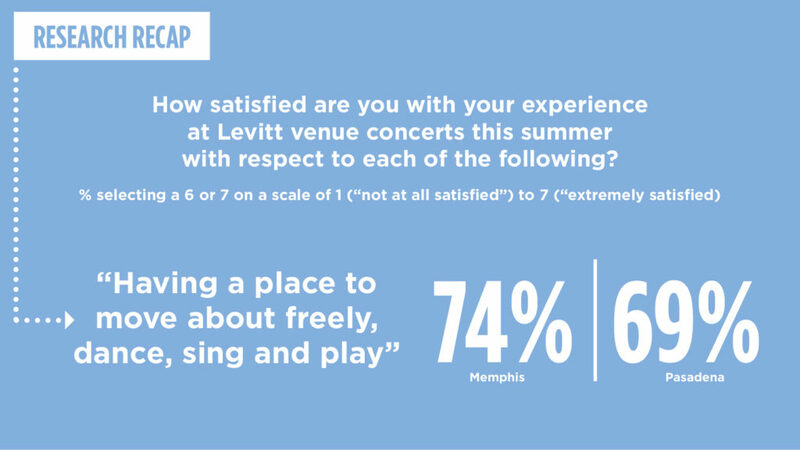 As you’ll see from the graph below, the majority of survey respondents in both Memphis and Pasadena value having a public space to move about freely, dance, sing and play. However, having an open space is only a part of the equation. One must feel comfortable and safe in a space to “move about freely, dance, sing and play.” With the fun, casual, family-friendly atmosphere and the “leveling effect” that Levitt’s open lawn setting provides, the environment itself encourages an atmosphere of inclusivity. Whether they’re singing, laughing, dancing, playing or relaxing, we see concertgoers of all ages and backgrounds liberated to experience free Levitt concerts however they choose. As a result, we’ve seen some incredible forms of self-expression at Levitt venues and sites across the country—so many that we were inspired to launch a hashtag campaign in 2015, capturing concertgoers’ fun #musicmoves on a live feed during concert season. Wishing all the trick-or-treaters out there a safe and fun night as they brighten up the sidewalks tomorrow evening! This entry was posted in Research Recap and tagged Grantmakers in the Arts, Sarah Lee, Sharon Yazowski on October 30, 2017 by Nicole McGaffey.